Prepare for giant spiders, dancing skeletons, winged goblins, and hordes of ghostly warriors! During the twelfth century, the Minamoto and Taira warrior clans waged decades of battles that were depicted in countless stories and pictures. In the final sea battle between the two clans at Dannoura in 1185, the brilliant commander Minamoto no Yoshitsune destroyed the Taira fleet and the leading members of the Taira family were slain or drowned. 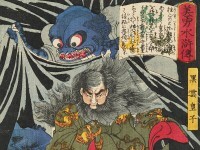 Soon afterwards Yoshitsune was caught in a terrible storm and the ghosts of the dead Taira warriors rose from the depths of the sea to sink the ship.